It’s become a running joke, among my friends, that I say something like this every few months, usually when discussion turns to the increasingly science fictional resonances of our everyday world. Science fiction writers can be a prescient lot, by trade. But William Gibson, in particular, has a remarkable track record for what seems like genuine prophecy, starting with his very first short stories, published in—surprise—OMNI Magazine. But science fiction writers can’t really predict the future. Can they? Sure, it can seem that way. Gibson foresaw many aspects of the Internet—famously coining the term “cyberspace”—with the publication of his debut novel, Neuromancer, in 1984. His subsequent books have proffered improbably accurate cultural premonitions on everything from reality television to our current surveillance state concerns. The latest technology item to prompt a Gibson invocation came by way of a New York Times article. The story concerns the development of so-called “stealth wear:” apparel and accessories designed to protect the wearer from modern surveillance technologies, including a line of hoodies using reflective fabric to block thermal imaging, along with accessories designed to thwart cameras and facial recognition software. One of the best documentary films of the year so far, the taut and disturbing “Blackfish,” addresses the contentious issue of killer whales kept in captivity at water parks. More specifically, it’s an exposé and full frontal assault on SeaWorld – and those guys don’t take things lying down. More on that in a bit. The film begins with the tragic 2010 incident in which a SeaWorld trainer, Dawn Brancheau, was killed by an orca named Tilikum at the flagship park in Orlando. Initial reports suggested the attack was an isolated incident and that an inexperienced trainer made a mistake in handling the animal. The killer whale Tilikum, in fact, had been involved in two other deaths, in 1991 and 1999. The film interviews a half-dozen former trainers, as well as eyewitnesses to the previous incidents and marine biology experts. The conclusion is that the whale likely suffers from a “psychosis” brought about by years in captivity. 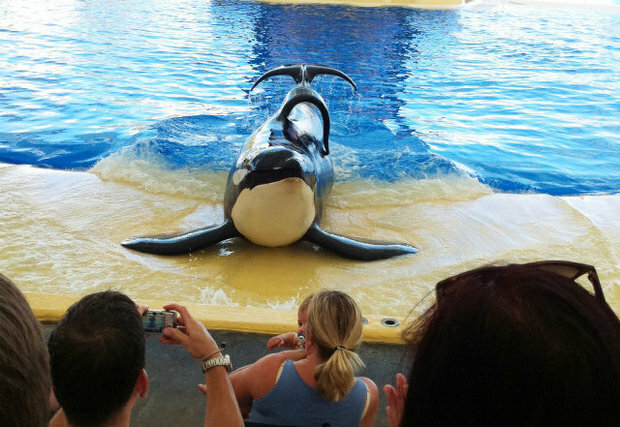 Several sequences show the miserable conditions that Tilikum was forced to endure, especially in his former home, a rundown carnival park in Canada. Much of the film is dedicated to arguing, quite persuasively, that keeping killer whales in family fun parks is a Very Bad Idea, for humans and orcas both. But what makes “Blackfish” more compelling than the usual advocacy doc is director Gabriela Cowperthwaite’s assured application of the storytelling craft. The film fairly vibrates with tension and dread as it circles back through SeaWorld’s secret history. Make no mistake, “Blackfish” is an advocacy film with a definite agenda. In this case, it’s advocating for the release of all killer whales kept in captivity for entertainment. But it plays fair within the unwritten rules for such films: The agenda is clear, the facts are on the record, and the filmmakers let the on-camera witnesses and experts make the indictments. After “Blackfish” started making waves upon release in July, SeaWorld took the unusual step of hiring a film industry publicity firm to email film writers and critics directly, calling the movie “inaccurate and misleading.” Director Cowperthwaite quickly replied with a point-by-point rebuttal. You can find the debate with a quick online search. Suffice it to say, SeaWorld does not fare well in the public relations skirmish. In fact, the company just posted a quarterly loss and analysts expect shares to tumble. The film ends with images of protestors outside SeaWorld gates and a bitter little coda: After the death of Dawn Brancheau, the U.S. Department of Labor ruled that trainers must remain behind barriers when working with killer whales. SeaWorld, however, is appealing the decision.